Easy, tool free assembly of legs and back. Blow molded bench and back provides comfort and strength. New pinch free cover allows for push pins to be depressed without pinching fingers. An audible click will be heard when secure. Drainage holes in seat and back reduce slipping. Aluminum frame is lightweight, durable and corrosion proof. Angles legs with suction style tips provide additional stability. Retail model comes with a durable nylon carry bag for easy and convenient transport. - Easy, tool free assembly of legs and back. - Blow molded bench and back provides comfort and strength. - Drainage holes in seat and back reduce slipping. - Angled legs with suction style tips provide additional stability. 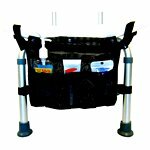 - Retail model comes with a durable nylon carry bag for easy and convenient transport.